Only The Good Die Young is Wild West action RPG with two completely different endings, many side-quests and even more battles! Jack Smith was a common thief until his path carried him into the village E. Lee, where new railroad has been in construction and he decided (not completely freely) to help. Will he keep his word, or will he help the bandits to destroy the railroad? 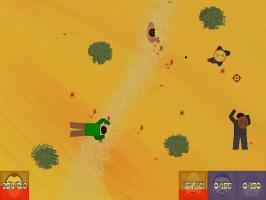 a clever combat system and even a two player duel mode. With a lick of paint, a round of proffreading and a bit of music, this could have been even much better but still well worth a go. I found out that the setup linked here was for the original, Czech version. I've fixed it now, so if anyone decides to try it out, you'll understand what's going on now in the game.